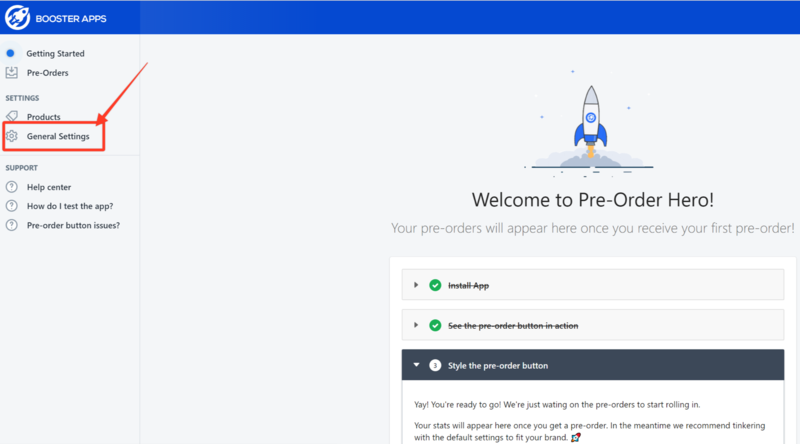 You can manage general settings for your online store and set customization such as how you want texts to appear, set pre-order limits when it comes to quantity, and create pre-order limit messages. STEP 1: In your Pre-Order Hero app, click on General Settings. STEP 2. Scroll down to the General Settings section. TEP 3. 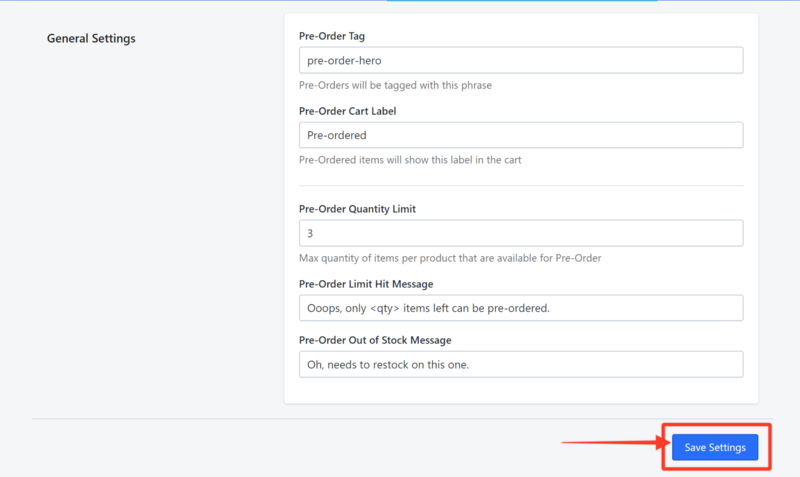 In the Pre-Order Tag field, enter a phrase that will serve as a tag for pre-orders. In this example, we use the default tag, pre-order-hero. STEP 4. 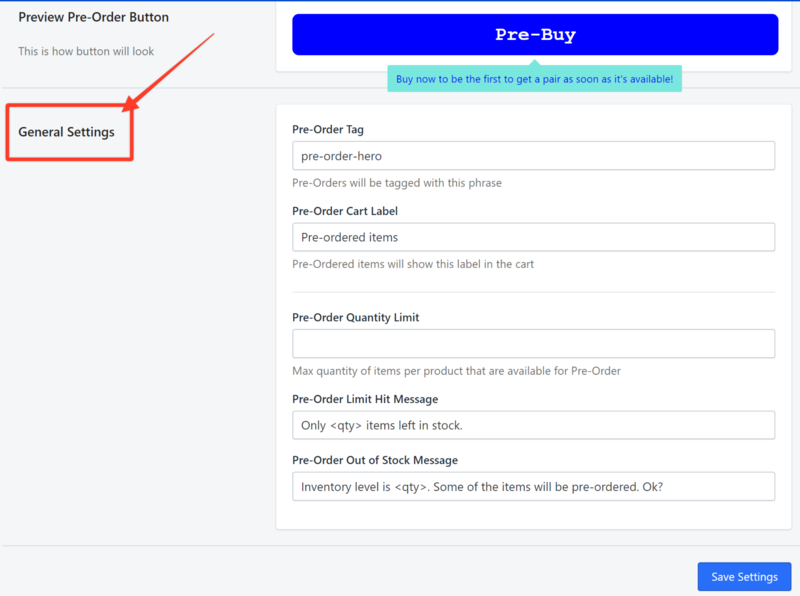 In the Pre-Order Cart Label field, enter a label for pre-ordered items. In this example, we use Pre-Ordered. This label will appear below the items in the customer's cart. STEP 5. In the Pre-Order Quantity Limit field, enter the maximum number of items that the customer can pre-order. You can also click on the up and down arrows to choose a number. In this example, we entered 3. STEP 6. 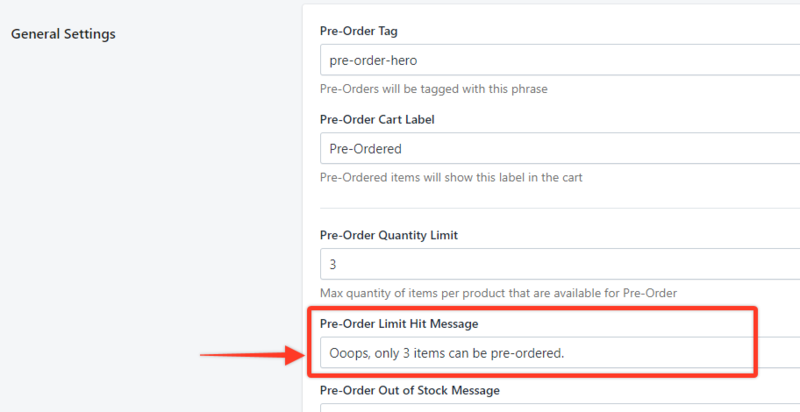 In the Pre-Order Limit Hit Message field, enter a short note that will appear in cases where the customer exceeds the maximum number of items allowed to be pre-ordered. In this example, we use Ooops, only 3 items can be pre-ordered. This message will appear in the customer's cart when he clicks on CHECK OUT after setting the number of items. STEP 7. 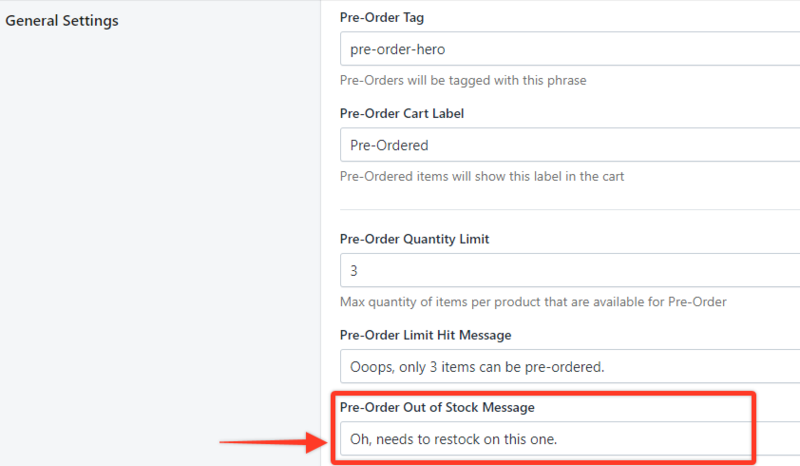 In the Pre-Order Out of Stock Message field, enter a message when the item is out of stock. In this example, we use Oh, needs to restock on this one. STEP 8. Click on Save Settings.